After a tiring 23 hour journey we finally arrived at our first stop, Rio de janeiro, or 'Cidade Maravilhosa' (The Marvellous City). We were greeted with glorious 33° heat as we made our way to our apartment by coach. Located in the Botafogo district of Rio and situated on the 12th floor of a beach-side apartment block, the flat had great local Brazilian charm. The location was ideal, equidistant between the northern Centro and the southern beaches of Ipanema and Copacobana, making it easy to get to both via the metro a short walk away. Naturally as brits the first port of call was the beach (and yes, we sunburned in the first 2 hours). 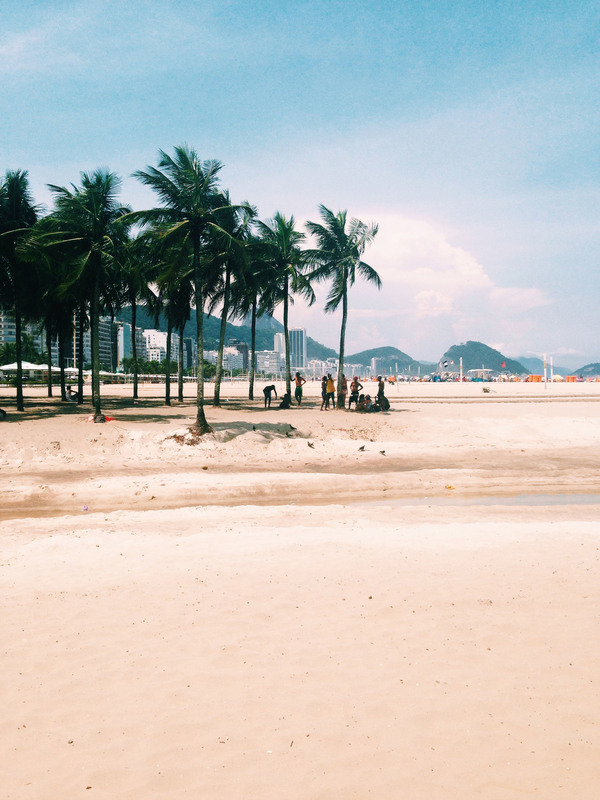 The beaches in Rio are just as you'd expect - golden sands, palm trees, and packed with people wearing skimpy beachwear. Once we got a spot the first thing we noticed was the massive amount of 'hawkers' selling you everything from beach sarongs and sunglasses to shrimp-clad skewers ('CAAMMAARROES') or full blocks of grilled cheese, but we actually quite enjoyed the constant flow of sellers wandering through the umbrellas - especially when they offered fresh 'Caipirinha' cocktails. We've heard a lot of mixed reviews about the Cristo Redentor due to the 'touristy' nature of the visit. Despite there being a fair amount of people at the top, (complete with ipads and 'selfy sticks' and sporting the 'Christ pose') for us it didn't detract from the experience. Even close up this fairly small statue has an iconic sense of place, and after the visit we were strangely comforted by the peaceful, watchful nature of Cristo Redentor. The train ride there and back through the rainforest of the Corcovado was also a lot of fun, if not a little hot and sticky. After getting the small train back down the mountain, we were recommended by our host Rafael to visit a small group of neo-colonial houses called 'Largo do Boticário'. We were blown away by the beauty of these old, decrepit buildings. The colours, intricacy of the architecture and contrast of the forest backdrop made for some great shots. We ended one of our first nights by talking a stroll along the seafront at Urca to one of the few restaurants near the cove. With views of the docks and kids playing beach football, it felt like there could be worse places to enjoy a Caipirinha and Brazilian steak cooked in front of you. Garota da Urca came well recommended, and although the food was quite simple, it was very tasty, and like most Brazilian food left little room for more than meat. We'd heard a lot of stories about mugging in Santa Teresa, especially at quieter times in the week, but we found that being sensible with valuables and sticking to the main street there were no problems at all. A traditional tram takes you right up the hilltop from the city centre through Santa Teresa (after a bit of a queue), giving great views of Rio. Walking back down along the tram route takes you to the 'Escadaria Selarón' tiled steps - a landmark of Rio and popular tourist spot created by late artist Jorge Selarón. Heading down the steps led us to the Lapa neighbourhood where we stumbled into a 'kilo restaurant', a simple canteen style place where you pay by weight.